This fun worksheet takes your student to the amusement park midway to the dart throw. 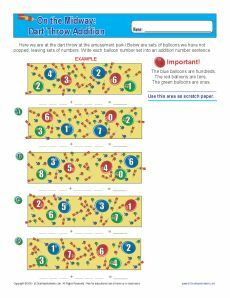 He'll add numbers based on the place values of the balloons. Ideal for use with 3rd grade Common Core Standards for Number & Operations in Base Ten, it may also be used for other students.